Thankfully, almighty Google scientists made some of their models open and available for everyone to use. Here, we will utilize Google’s lm_1b pre-trained TensorFlow language model. Vocabulary size of the model is 793471, and it was trained of 32 GPUs for five days. If you want to learn the details, please refer to this paper. The entire TensorFlow graph is defined in a protobuf file. That model definition also specifies which compute devices are to be used, and it set to use primary CPU device. That’s fine, most of us will not be able to fit the large model parameters into conventional desktop GPU anyway. The original lm_1b repository describes steps somewhat awkwardly. You need to do some manual work, and run Bazel commands with arguments to use the model. If you want get embeddings, you need to again run Bazel commands with your text in the parameters and it will save results into a file. On top of that, their inference and evaluation code is written for Python 2. The code and instructions provided here allow you to fetch embeddings in a run-time of a Python 3 code in more flexible manner. Before you start, make sure you are working on a modern system with at least 20 Gb of RAM. In its raw form, Google’s model has 1.04 Billion parameters. My relatively powerful system has 16 Gb of RAM, and with couple of open Chrome tabs, the model is unable to fit the parameters into the memory. Therefore, the work was done on a Google Cloud instance with 26 Gb of RAM. Let’s say that you are working in a project folder called ‘my_project’. To fetch the pre-trained model, execute bash code provided below. You can either download the code and run it, or just copy and paste this into your terminal. Note that entire model weighs around 4 Gb, so it might take some time for the script to finish executing. Next, we initialize our variables and tensors. Now, we can define a function that can compute embeddings. This specific function below propagates through entire text it’s given. Here are the example text sampled from Cosmopolitan.com. Results are very good. 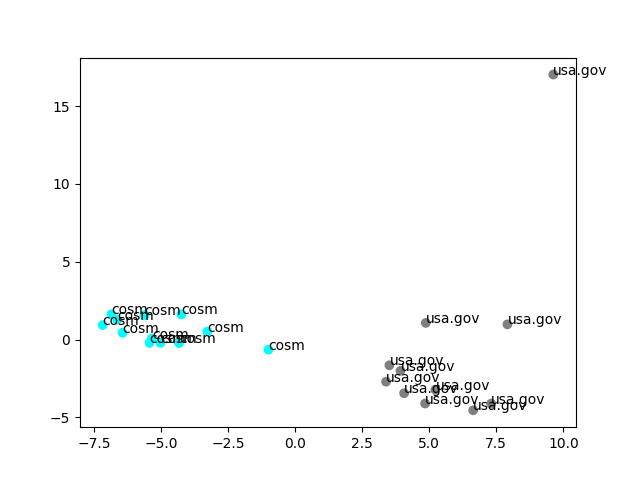 As you can see in the plot below, texts from the same sources cluster together. Since the original embedding are 1024 dimensional and we are simply projecting them with PCA for visualization, representation is not perfect, thus we see a point far away from the rest. Thank for reading! Hope you will have fast convergence and small losses on your test sets. Why Does Batch Normalization Work? Abay's Blog, Proudly powered by WordPress.